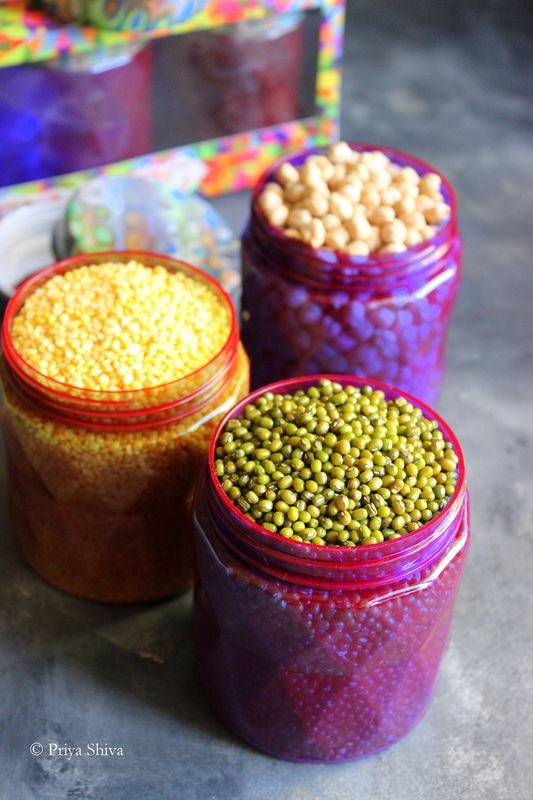 Storing grains and pulses in your pantry or kitchen can be challenging. The biggest threat can be the attack from bugs and insects. So, it is important to store the grains properly and keep them free from micro-organisms. Sun drying is one of the oldest method and easiest method used to store food grains. Sun drying removes any moisture and keeps it fresh for a longer time. Dried Neem leaves – Pluck fresh green Neem leaves and dry them in the sun. Spread these dried neem leaves in the bottom of the container. Dried Red Chillies – Add 2-3 dried red chillies in the container holding your lentils and legumes and it will keep away the insects. Roasting – The best way to store semolina or broken wheat is to roast it on a low flame for few minutes. Cool it and store in an airtight container. You can store it in freezer too. Camphor – Small pieces of camphor tied in a piece of cloth will keep away the worms from rice. Boric Powder – Mix boric powder with rice and pulses to keep away the insects. Your kitchen racks and shelves can very easily become chaotic if you are not careful. Organize things neatly in your kitchen. One of the quickest and simplest way to organize your kitchen shelves and make it look neat and tidy is to transfer food items into matching jars. It is important to keep your pantry clutter free and store grains in clean jars. I recently came across these Gem Jars by Nani. 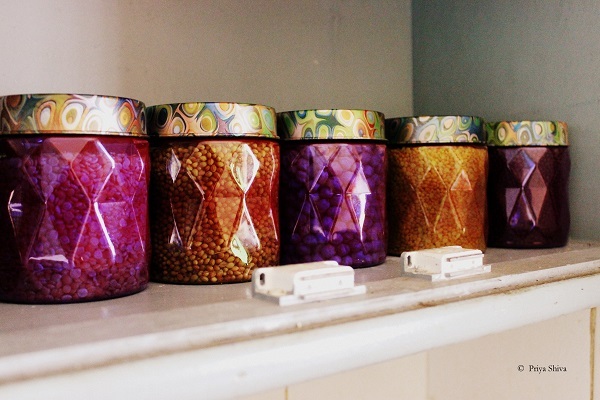 These gem jars are so vibrant and make your kitchen look pretty too! 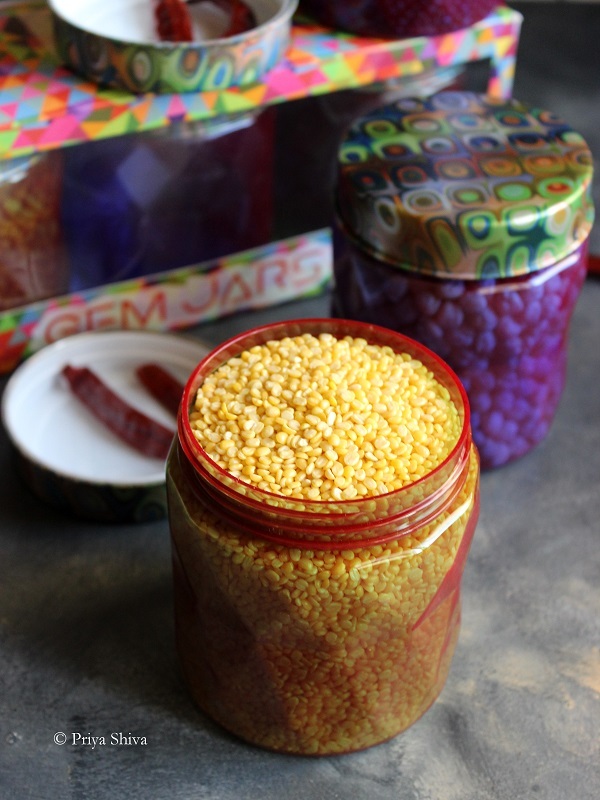 I love these Gem Jars and would recommend them for your kitchen too. So, Click here to know more about their products and place order for Gem jars. These plastic gem jars are BPA free and light weight too! The two most common herb used in the kitchen are Coriander leaves and Curry leaves. I use Nani Lock & strong containers to store these herbs. 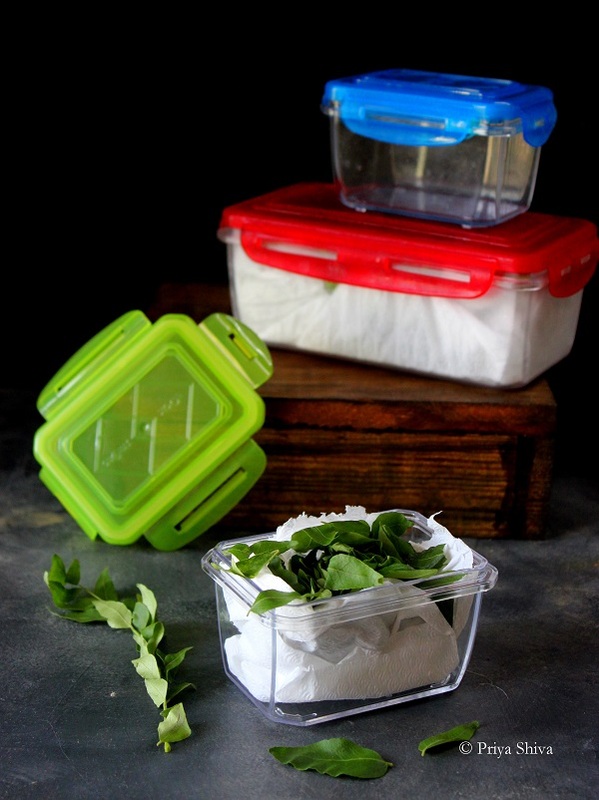 These containers are made with tritan plastic and BPA free. It is light weight and leak proof. These boxes can be used for various purposes. – Trim the ends. Remove any damaged or dried stems and leaves from the bunch too. – Spread it on a paper towel and let it dry. – Place a dry paper towel in an airtight container. 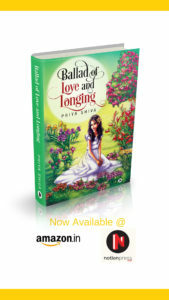 – Arrange layers of coriander leaves. – Place another dry paper towel over it. – Close the container and refrigerate. – It stays fresh for 2 weeks. – Separate curry leaves from the stems. Remove any damaged or dried leaves from the bunch. 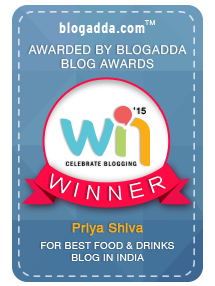 – Add all curry leaves in it. – It stays fresh for 2-3 weeks. I also use Nani Lock and strong containers to store freshly scraped coconut. I’m a South Indian and coconut is used in our diet every day. It could in sides like chutney or for main dishes like kozhumbu and curry. Nani Lock and Strong containers are so handy to are easily to clean and durable too! These Nani lock and strong containers are microwave safe. So, I can store scraped coconut in freezer in these containers and directly microwave them to defrost it. 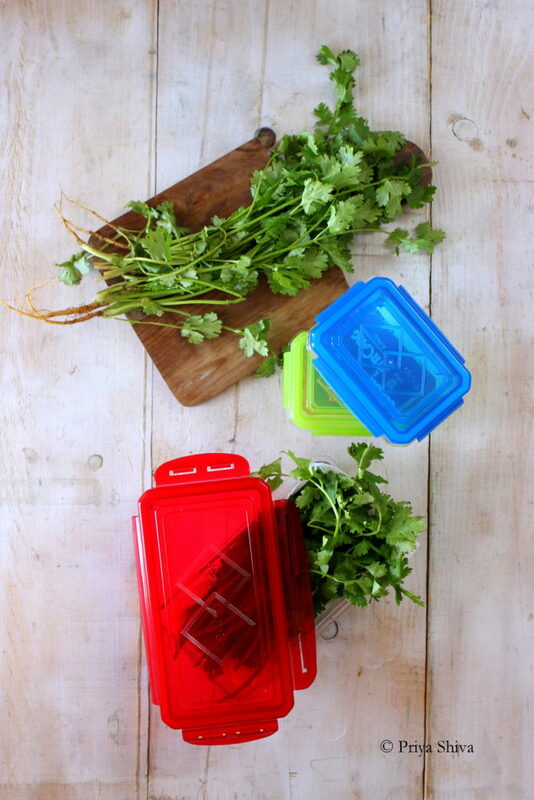 These containers adjust to any temperature without breaking! Click here to check out more details and order these containers for yourself. Break a coconut and scrape out complete coconut from it. Store this freshly scraped coconut in Nani Lock & Strong and freeze it. Use when required and it stays good for upto 3 months. These Nani products are easy to clean too. Use soft or microfiber scrubs to clean these jars and containers. Use dish washing soap or liquid soap and rinse under water to clean them. I hope you find these Food storage tips useful. Please do share your feedback and kitchen tips with us too. What a great guide! I always got my herbs go bad too soon, and can definitely use your tip. Thank you! Thank you Natalie. I’m glad you find it useful. 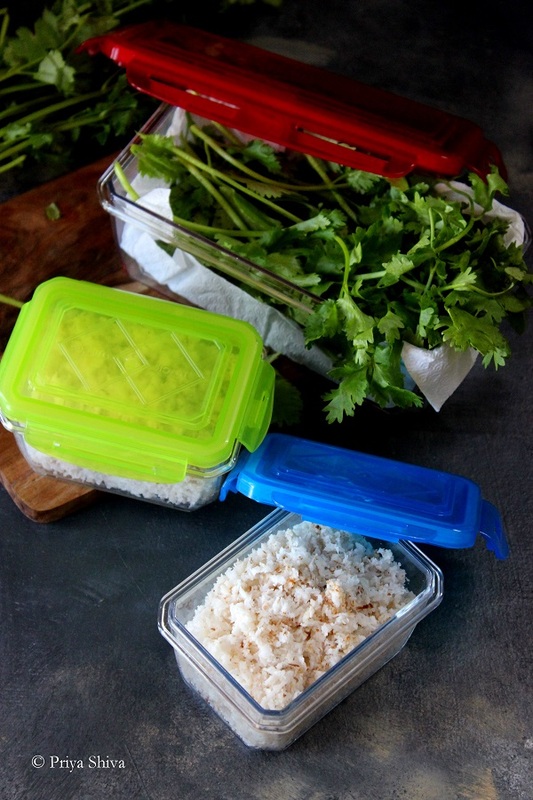 Love all these tips I was definitely not storing my grains and herbs correctly! Thank you Emily. I’m glad you found the tips useful. I sooo needed this post as I am forever throwing away grains, and especially herbs because I stored them incorrectly ! Thanks for sharing ! Thank you Linda. I’m glad that you found it useful. I’m glad you like the shared tips Danielle.